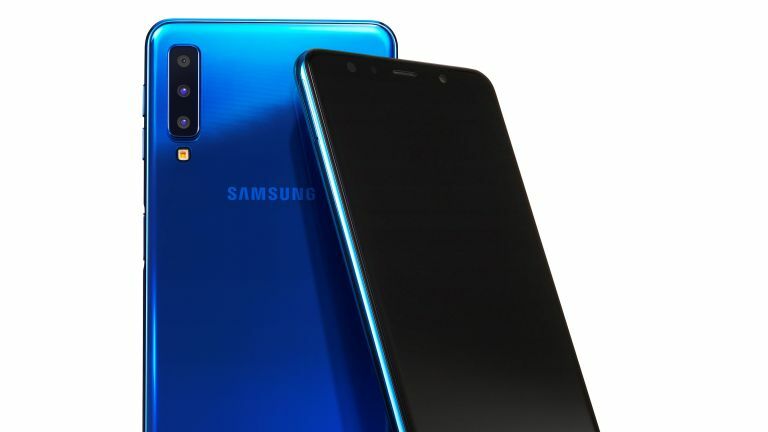 In a move that strongly points to the Samsung Galaxy S10 and Note 10 getting a decent camera upgrade, Samsung has just announced the Galaxy A7, which features a triple rear camera. The mid-range handset is Samsung's first smartphone to come with three-cameras – the Galaxy S9 features a single rear camera with dual-aperture technology, while the Note 9 packs a dual rear camera set-up. Pricing and availability for the Galaxy A7 have yet to be announced. It's not surprising to see Samsung beefing up its camera arsenal. The South Korean smartphone maker has always made a big deal about its cameras. The Galaxy S9 was promoted with the line "The Camera. Reimagined", for example, so it must have been pretty galling to see Huawei rock up with three cameras on the back of the Huawei P20 Pro when it was announced just two weeks after the S9 was officially unveiled. No doubt that contributed to Samsung's CEO recently promising that 2019's Galaxy S10 will feature "very significant" design changes. So now Samsung has joined the triple camera party, and we can expect the S10 and Note 10 to feature a similar set-up – after all, it's unthinkable that Samsung's flagship 2019 phones would have worse specs than its mid-range A7. We say a similar set-up, because the triple camera array on the A7 could merely be Samsung's opening salvo in the upcoming smartphone camera war: a Galaxy event that the company is planning for October 11 suggests that Samsung's next move could be to release a FOUR camera Galaxy.